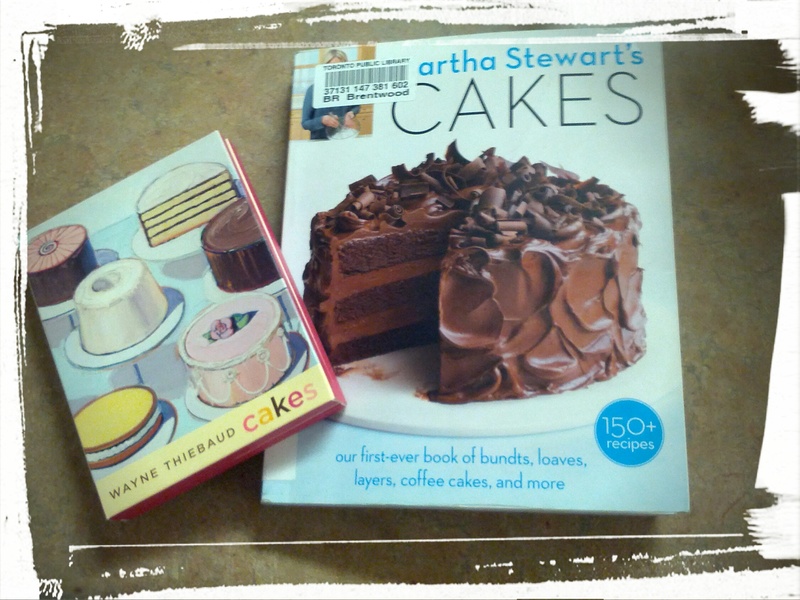 Poundcake Smackdown: Marga-Martha in the House! So I was trying to think of some features to have regularly on this blog, and I thought a recipe smackdown (word totally borrowed from my favourite column, Advice Smackdown by Amalah) would be an awesome thing! That’s right, it’s a recipe showdown! In this corner, Martha Stewart! In the other corner, some random recipe I found on the back of a notecard! 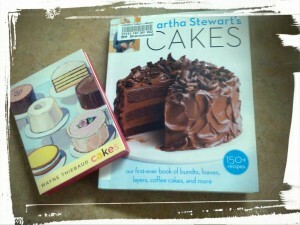 I mean, obviously we had to start with a Martha Stewart recipe. The only other logical choice was Julia Child and JulieandJulia was all over that. And anyway, I read somewhere that Martha Stewart started catering after she cooked everything from Julia Child’s recipe book, as she then felt she had mastered cooking. And poundcake, because a) I like my sweets and b) sour cream was on sale. Tangential story, the year after I graduated from university, I had several part-time jobs (at one point, I was working five part-time jobs. Simultaneously. Yeah. I like to stay busy.) including one at the University of Toronto in a psychology laboratory. I would take the TTC for over an hour to get there, work all day in a highly air-conditioned dungeon of a laboratory, and head home on the TTC in the evenings, only popping out to grab lunch from a food truck or that yummy bakery on Harbord St. Even though I was working long hours, I still liked to bake during my (ha!) downtime. I also liked to spread the sweets love, so I often brought yummy things to work (including my super-duper brownies, the recipe for which I’ll give you another time, the recipe which brought me fame and acclaim from my friends and their parents and on and on and so forth). The other lab peeps ended up calling me Marga-Martha; I wore the name with pride. But back to our smackdown! 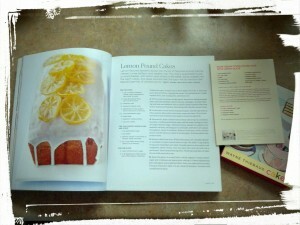 So, it’s Martha Stewart’s Lemon Pound Cake from her Cakes book vs. 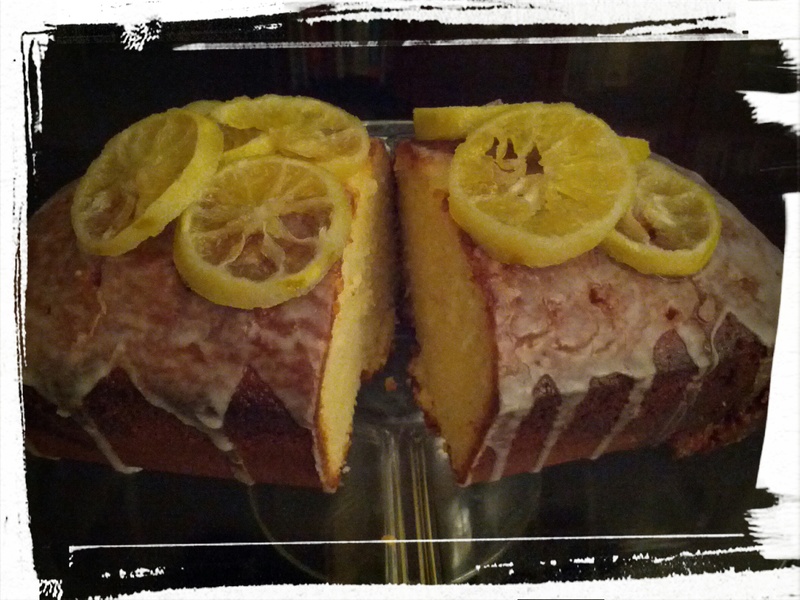 Lemon Sour Cream Pound Cake (literally from the back of a notecard – see the picture in the next post) for our first Recipe Smackdown! Mix butter and sugar until fluffy. Add eggs, one at a time. Stir in vanilla. Add flour/baking soda/salt mixture, alternating with sour cream. Grease pan, pour in a bit of flour and shake it all around until the pan is lightly floured, and pour in batter. Bake for 35-45 minutes, until a fork/knife/skewer inserted into the centre comes out without unbaked batter on it. Boil the water and sugar together until the sugar is dissolved. Then simmer the solution with the lemon slices in it, until the slices are opaque, about 35 minutes. Remove the slices and let them rest on a tray or plate or what have you. (Martha says wax paper.) 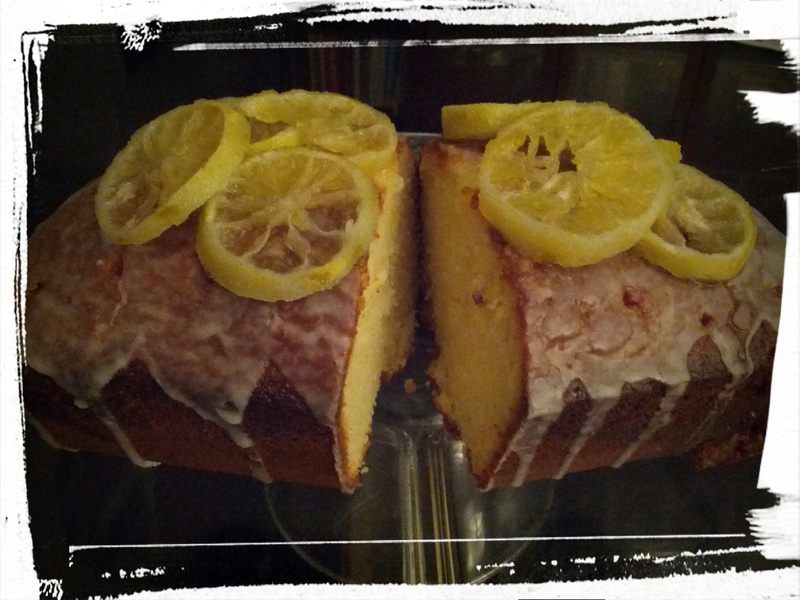 Stir the lemon juice into the sugar syrup that is left after you remove the slices. When the cakes are done, use a chopstick or skewer and poke holes in the cakes all over. Then pour almost all of the syrup over the tops of the cakes. Let them sit until they’re cool. Then remove them from the pan and paint the sides of the cakes with the remaining syrup (this helps stop the cake from drying out). Pour over cooled pound cakes. Let sit until dry, and place candied lemon slices over the top. Rejoice in your baking skills. Boast. And let us eat cake! If you squint real good, you can even read the recipes. And…here’s the finished product! Pretty awesome, huh? 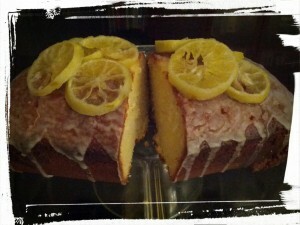 Deliciousness, thy name is pound cake! Here’s another picture. I kind of like this one better, but it has a crumb showing in it (perfectionist much, Margaret? ), so I retook it, which is the picture you see above. My advice: use a mandolin to slice the lemon for the candied lemon slices so that they’re super thin or else they won’t candy properly. (Candy is now a verb. I said so.) Also, I used limes instead of lemons (although I did use lemon juice to add to the juice of the limes that I used) because that’s what I had lying around and I’m all about the substitutions (I have got to tell you about my cake pop substitutions one time. Remind me, ok?). The verdict? Yum! A bit labour intensive but very pretty. It’s supposed to make two loaves but I only had one loaf pan so I made one loaf (surprise!) and a dozen mini bundt cakes. If you’re making mini bundt cakes in a pan, make sure to under-fill them, as I didn’t and ended up with muffins tops on the bottoms of my mini bundts. (Say that seven times fast! Or better yet, with innuendo!) The DH didn’t care, he just called them muffins and when I woke up the next morning, the ones that were out on the counter had mysteriously disappeared. There were a few in the freezer that he didn’t know about, two packed for our lunches the next day, a couple in my tummy, and the rest in his. About 36 hours later, the entire loaf was gone (I will admit to having eaten a bit more than half of it. What can I say? I did tell you that I like my sweets! ), so I think we can call the recipe a success. I liked the moistness of the cake that came from the soaking with lemon simple syrup, so I’d definitely recommend that you don’t skip that step. You can easily skip the candied lemon slices though, pretty as they are. Oh, and how on earth did she get the icing to be that white? I followed her icing recipe exactly and mine was more translucent. Did she cheat? Is that really glue in the photo, masquerading as icing? Only her food stylist knows for sure. If you make this recipe, let me know, okay? I’d love to hear what your thoughts on it are. 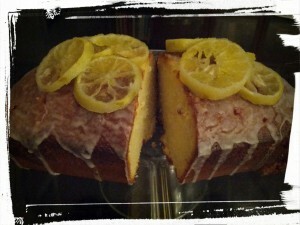 Next Post: Sour Cream Citrus Pound Cake with Lemon Glaze and why my wedding thank you notes are late. This entry was posted in Cakes, Recipe Smackdown on August 18, 2014 by Margaret.